Holiday.gr - Katapola, a trip to a myth! 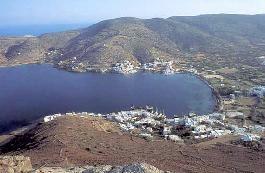 The cove of Katapola is one of the biggest natural ports in Aegean Sea. It is located 5km southwest of Chora (town). It is a beautiful and graphic port with three villages around it. Katapola, Rahidi and Xilokeratidi. Built in an idyllic atmosphere, according to the traditional architecture of Cyclades islands, are ideal for your staying. There are a lot of hotels and rooms to let, while in the taverns viewing to the sea you will taste local recipes. Options for entertainment vary. In Katapola you will swim in the homonym sandy beach and in Finikes, a beautiful shore. Maltezi's beach with sand and small pebbles can satisfy all demands. An exquisite proposal is the beach of Agios Panteleimonas with clear blue waters. You can only reach it by following the path from village Xilokeratidi or by the boat that tours around the island. On the hill above Katapola are located the remains of the ancient town Minoa that flourished during the historic times. The visitor can see part of the ancient town walls, the ancient Acropolis, the Gymnasium and the remains of temples from Hellenistic times. Don't miss to visit Panagia Katapoliani. The church dedicated to her is a typical specimen of the architecture of Cyclades islands. It is built on the remains of the ancient church. Been to Katapola ? Share your experiences!